Although you may see an “I” in the word Organize, the sentiment doesn’t match when the IAM is on the job. That’s especially true in the Southern Territory where, at times, organizing can be considered a team sport, with everyone sharing a spot on the starting line. That’s exactly what happened with the workers at WFI International, Inc. in Houston, TX who just voted ‘YES’ to the Machinists Union in 17-7 win. “Initially, the WFI lead came from the IAM’s Transportation department. But because this was a group of machine shop workers, Transportation General Vice President Sito Pantoja allowed the Southern Territory to run the ball. 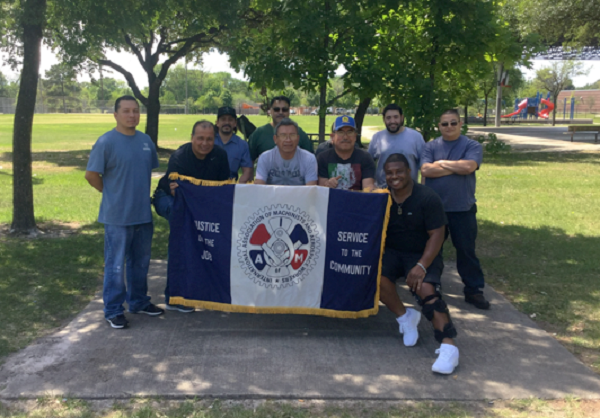 In the end, by working together, there is a group of workers in Houston that will now proudly be backed by a great IAM contract. That is the end result everyone involved wanted to see. That’s the only thing that counts when it comes to organizing,” said Southern Territory General Vice President Mark Blondin. But the team effort didn’t stop there. Directing Business Representative of District Lodge 37 Byron Williams said he could not have accomplished this vote without the help of his Brothers and Sisters at the Southern Territory office. According to Williams, ST Grand Lodge Representative James Parker and Ramon Garcia were both huge assets. Parker for his years as an experienced organizer and Garcia for his communications skills in both Spanish and English. Both using their knowledge to make the IAM understand exactly what WFI workers needed and wanted. By working as a team, this group of workers is going to have a voice on the job. Safety, seniority and long, overdue wage increases are the main issues that will be addressed in the first contract.